Diodes are electronic components that only allow current to flow through them in a single direction, like a one-way street. Light-Emitting Diodes (LEDs) are a kind of diode that emit light when current flows through them. Grab an LED and take a look at it. The longer leg is called the anode. That's where current enters the LED. The anode is the positive pin and should always be connected to current source. The shorter leg, the cathode, is where current exits the LED. 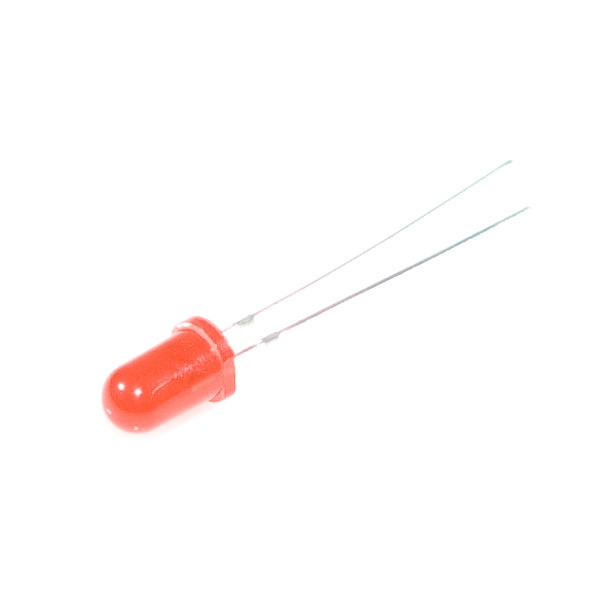 The cathode is the negative pin and should always be connected to a pathway to ground. Many LEDs also have a flat spot on the cathode (negative) side. If you apply too much current to an LED, it can burn out. We need to limit the amount of current that passes through the LED. To do that, we'll use a resistor. When you use a resistor in this way to limit current, it is called — surprise! 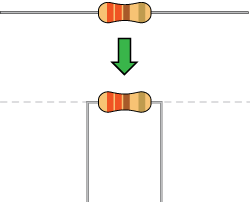 — a current-limiting resistor. With the Tessel 2 board, you should use a 100 Ohm resistor. We have included a baggy of them in the kit just for this reason! If you're curious to learn more about how voltage, current and resistance relate to one another, read this tutorial about Ohm's Law. Its now the fun part! It's time to start building your circuit. Let's take a look at what goes into building this circuit. LEDs are polarized, meaning they need to be oriented in a specific direction when they are plugged in. You don't want to plug a polarized part in backward! On the other hand, resistors are not polarized; they're symmetric, which means they don't have an opinion about which way current flows across them. You can plug a resistor in facing either direction in a circuit, and it will be just fine. All jumper wires work the same. They are used to connect two points together. 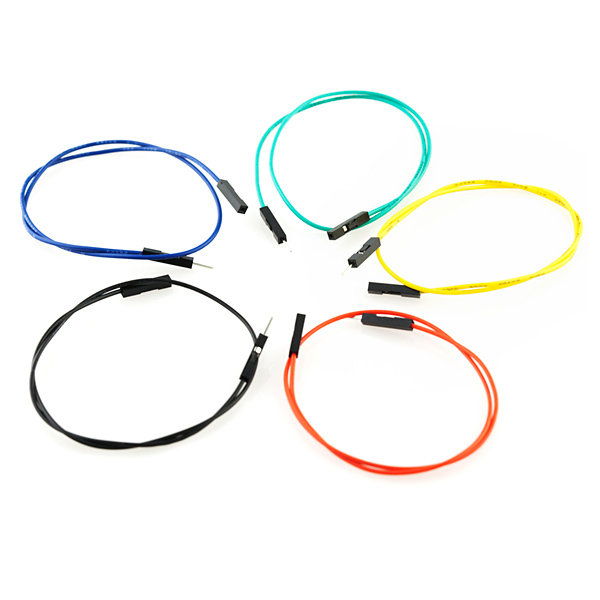 All of the experiments in this guide will show the wires with different colored insulations for clarity, but using different combinations of colors is completely acceptable. Breadboards are vital tools for prototyping circuits. Inside the breadboard there are electrical connections between certain sockets. Power rails — columns on the left and the right of the breadboard — are electrically connected vertically, while terminal rows — rows in the middle of the breadboard — are connected horizontally (note that connections do not continue across the center notch in the breadboard). You can read a tutorial about breadboards to learn more. Each of the experiments in this guide will have a wiring diagram. They'll show you where to plug in components and how to connect them to your Tessel 2. Plug the LED into the breadboard, taking care to plug the cathode into row 1 and the anode into row 2. Make sure not to plug it in backward! Connect a 100Ω resistor between the LED's cathode and ground as shown, spanning the notch in the middle of the breadboard. 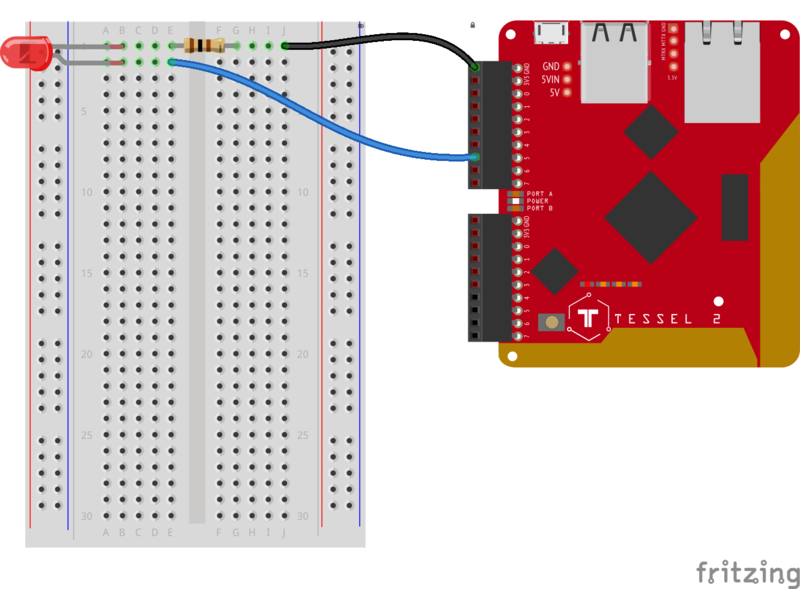 Use jumper wires to connect the breadboard's components to the Tessel 2: connect ground (row 1) to the Tessel 2's Port A GND pin and source (row 2) to the Tessel 2's Port A, Pin 5. Let's take a deeper look at what's going on in the led.js Johnny-Five code. Note: For Node.js to be able to find and use the modules, you need to use npm to install for the project. That happened when you set up your working environment—you used npm install to install both the tessel-io and johnny-five modules. This creates a new instance of a Johnny-Five Board. Johnny-Five supports many kinds of development boards. The support for some boards is built right in to Johnny-Five, but others — including Tessels — rely on external plugins encapsulated in modules. That's why the code requires the tessel-io npm module. Here, we tell Johnny-Five to use a Tessel object for IO when communicating with the board. Because the Tessel 2 board initialization involves hardware and I/O, it takes a few moments—considerably longer than the rest of the led.js script would take to execute. The initialization of the board won't get in our program's way—it happens asynchronously, allowing our script to keep executing statements without blocking—but we need to schedule something to happen when the board is ultimately ready. The code snippet defines a function that will get executed when ('on') the board emits the ready event. Next we need to fill in what that function should do when the board is ready to go. Instances of Johnny-Five's Led class have some handy tools (attributes and methods) for doing LED things—for example, blink.. This code creates a new Led object and tells it what pin to use (in this case "a5"). Then it tells the LED to blink every 500 milliseconds (half a second). That means the LED will cycle 500ms off, then 500ms on. Another thing you'll notice is that Arduino code is lower-level, meaning that there are fewer abstractions of specific hardware details. Instead of having an LED object that can do LED-like things (blink, pulse, fade, etc. ), you interact directly with the digital pin and write LOW and HIGH states to it. Between those digital writes, you tell everything to stop and wait for 500 milliseconds (delay). And the thing about delay is: it stops everything. It's a process-blocking operation. Nothing else can happen while delay, well, delays. In terms of code complexity, the difference between Johnny-Five and the Arduino Programming Language isn't too significant when you're just blinking an LED, but when it comes to pulsing an LED, Arduino sketch code starts getting more complicated. Now that we've covered the basics and some of the lower level technical aspects of Johnny-Five, let's write a program that pulses the LED. Instead of blinking the LED on and off, pulsing fades the LED smoothly from off to on, and then from on to off again. With PWM, the pin can be switched between HIGH and LOW very quickly, causing the LED turn on and off, too. This cycle between on and off happens too fast for the human eye to discern. The percentage of time that the pin (with the LED attached) is HIGH (on) over a given period is its duty cycle. A 30 percent duty cycle (on — or HIGH — 30% of the time) will make an LED look like it's partially lit — dimmer than bright but definitely on. By adjusting the duty cycle over time, we can fake (very convincingly!) an LED fading on and off. Only certain pins on development boards support PWM. On the Tessel 2, pins 5 and 6 on both ports (A and B) support PWM. Pulsing an LED in an Arduino sketch (Arduino Programming Language) requires more effort than blinking. Much has changed here from the blinking sketch, but certain things remain the same. There is still a process-blocking operation (delay), this time for 30ms on each loop cycle. We can no longer use the digitalWrite() function (it can only write binary LOW or HIGH); instead we'll need the analogWrite() function for writing PWM values from 0 (0% duty cycle) to 255 (100% duty cycle). There are also now three variables to keep track of: led for the pin number, brightness to track the present brightness state, and lastly fadeAmount which holds the increase or decrease value to be applied to the value of brightness. Whew! It may be hard to get your head around the logic in that program. It's not that easy to read. It doesn't scream "pulse an LED" in the way that it expresses itself, does it? Your LED should be pulsing in 500ms period cycles. Try adjusting the speed passed to the led.blink() and led.pulse() calls. For example: led.blink(1000) or led.pulse(1000) would change the cycles to 1000ms periods.